I met Adith (Adithya Pratama) back in World Street Food Congress earlier two months ago. From there I could really tell that he's a passionate foodie, and from the way he explains food I just could tell that he's a culinary student graduate - Yes, very much detailed :p. But who knew, he also turns out to be Dapur Cokelat's Pastry Chef, one of the most leading chocolate shop chain in Indonesia, being consistently passionate for providing exceptional-but-affordable cakes & pastries for nearly 12 years. 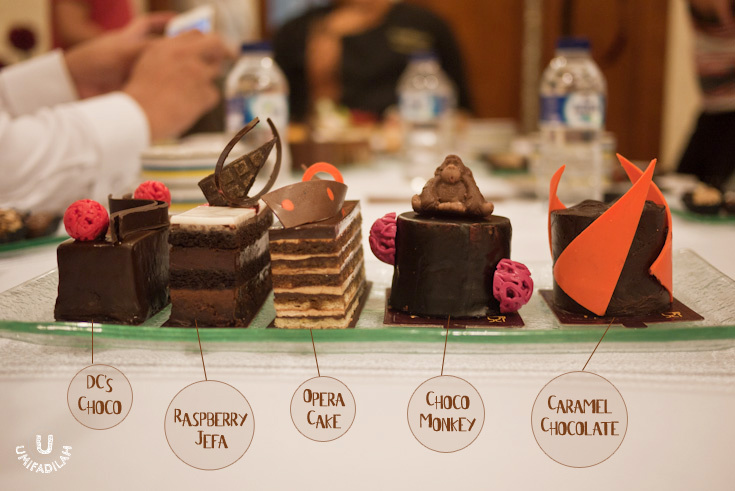 Dapur Cokelat had recently just launched their new line of Personal Cakes. I had the privilege to attend their Blogger Tea Time's Gathering about a month ago, and boy, was that pure chocolate madness or what! I get to sample probably 9 out of 16 new cake creations, and that doesn't include the free-flow pralines, truffles, and those lovely 8-variety of chocolate pebbles - truly my favorite. These pebbles are super great for snacking, and my #1 pick is definitely Dark Chocolate Coffee Bean. Can't hardly stop! At only IDR 37.500 per 100gr I’d love to always keep them stocked at my home pantry. DC'S CHOCO (Rp.16.000,-) Flourless chocolate sponge cake coated & glazed with dark chocolate ganache. RASPBERRY JEFA (Rp.21.500,-) The blend of raspberry & dark chocolate mousse with cashew chocolate sable. OPERA (Rp.20.000,-) JAKARTA'S BEST OPERA! Layers of coffee buttercream & dark chocolate ganache with almond jaconde. CHOCO MONKEY (Rp.15.000,-) Monkey's favorite treat inside a rich dark chocolate mousse! CARAMEL CHOCOLATE (Rp.22.000,-) High-cocoa dark chocolate cream and crunchy chocolate sponge, for true chocoholics! TRIPLE DECKER (Rp.17.500,-) Chocolate sponge cake with dark chocolate mousse, vanilla pastry cream & dark cherry filling. TIRAMISU (Rp.19.500,-)The Italian's pick-me-up! Layers of mascarpone cream with coffee-soaked sponge cake. MOCCA (Rp.15.000,-) Our version of the timeless buttery cake, sandwiched with Mocha flavored buttercream. JAVA CHOCOLATE (Rp.15.000,-) Caramelized cashew chocolate mousse paired with almond sponge cake. HAZELNUT PRALINES (Rp.25.000,-) Chocolate truffle & hazelnut cream spiked with rum married to crispy biscuit & chocolate mousse. FRUIT SHORTCAKE (Rp.15.500,-) Light & fluffy vanilla sponge cake coated w/ whipped cream, topped w/ daily picked fruits. STRAWBERRY CHEESECAKE (Rp.22.000,-) Boston baked cheesecake with cheese cracker crust topped with fresh strawberries. MANGO CASSATA (Rp.18.000,-) Fragrant mango & chocolate mousse with layers of chocolate sponge cake inside. FRUIT TARTLET (Rp.12.500,-) Buttery tart shell filled with vanilla pastry cream with daily-picked fruits. RED IN BLACK. Dapur Cokelat’s interpretation of red velvet. This time, plus Oreo crumble! Now, usually when you’re faced with so many options it’s just hard to pick which one to go for. I remember being so indecisive that night because we were all so overwhelmed with the choices so we ended up picking few names that are definitely intriguing. Starting from Hazelnut Pralines, which is a MUST for hazelnut & rum lovers. Mocca, as described, is undoubtedly one of the most classic buttery cake and Dapur Cokelat did a very good job on that. Red in Black, DC’s version of the oh-so-popular Red Velvet, with a twist of Oreo crumbs making it kid’s favorite. Mango Cassata, this – came as a bit of surprise to me – usually when you combined fruits and chocolate at some point it could easily go wrong as to make them looked ‘cheap’. But I was very wrong, Mango Cassata turns out to be rich and elegant; hands down my personal pick for DC’s Personal Cake of all (that I tasted). Mango & chocolate mousse, with chocolate sponge cake layers inside, mango jelly & coarse chocolate flakes at the bottom; every elements just worked together beautifully. Although there were also a few that became my least favorite such as Caramel Chocolate, you’d barely taste the caramel because the dark chocolate is quite overpowering. And Tiramisu, not exactly the best tiramisu I’ve ever tried but DC has its own interpretation of the dish and it’s actually quite decent. And finally, not to forget what’s been voted as Jakarta’s Best in 2003/2004: their Opera cake. Layers of coffee buttercream, dark chocolate ganache, and almond jaconde. Whoa, even I get all high on chocolate only by composing down this post. And have I mentioned that, beside the privilege of all-you-can-pick Personal Cakes, all of us also get our own portion of Choco De La Crème? A super soft texture achieved from combining vanilla & chocolate crème brulee and a bit of almond sponge cake layers, coated with dark chocolate ganache and topped with sprinkles of edible 24-carats of gold. Well, it was… divine. I hope you’d imagine how good it tasted. Like all of the above hadn’t got us into sugar-rush mode already, I just couldn’t resist ordering their infamous Chocolate drinks. 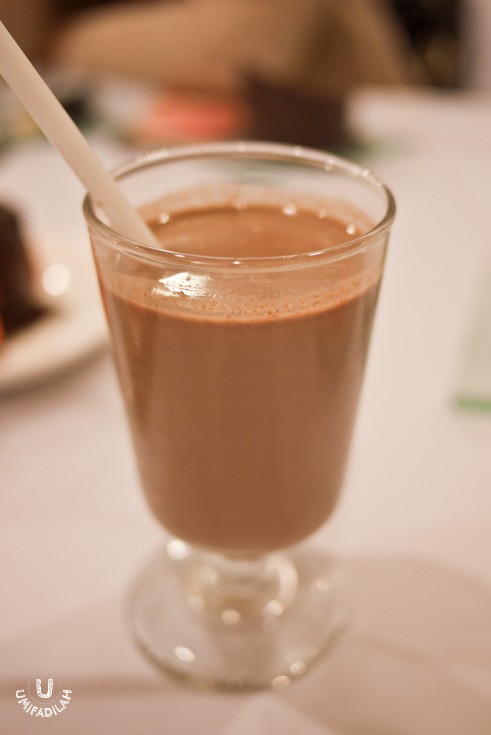 I remembered few years ago when I took my first sip of DC’s signature Iced Chocolate – I do remember, BTW – it was a taste that I could still distinct until now, even after tasting so many chocolate drinks. The ratio of milk & pure cocoa just struck right into my palate, saying: YES, this is the beverage I would love to sip every afternoon! 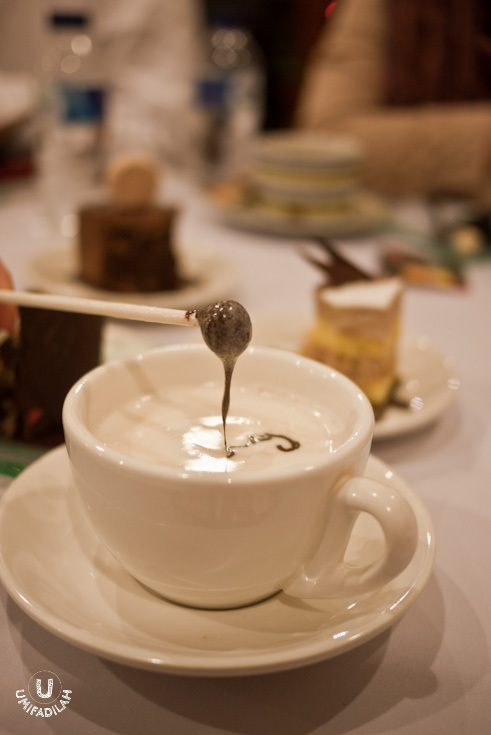 And if you prefer warm beverages, their Classic Hot Chocolate is surely not to disappoint – with unique presentation, a cup of full cream milk plus a chocolate lollipop – it makes you feel like a kid again. Haha, I just love the dip & stir concept on hot chocolate drinks. I know this is quite a late post since the launch >a month ago, but you can still enjoy DC’s Personal Cakes selection up until now and I suggest when you do, do order their Chocolate pebbles take-home pack and Chocolate drinks additionally – then that would make your visit worth every miles.... (and traffic). For more locations, visit this page.